Nowadays it’s easy enough to look up information on your hand-held device, but imagine if you were left with only your eyes and mind to shape an intuitive response to a work of art. Imagine that even if you had no way of ever knowing about the artist’s original intent, you could still have a profound experience with an object because you were fully tapped into how your feelings and energy were connected to it. Think about it, isn’t this is how we size up strangers all the time? Without ever having a conversation we begin to shape a judgement of another person based on our intuitive reading of them. Some of us are better at listening to our inner voice than others. I bet that the intuitively gifted might be able to ascertain meanings with their eyes closed. Does this mean you’re a psychic? Intuitive experts, Krystal Krunch, a.k.a. Asher Hartman and Haruko Tanaka, do not claim to by psychics. However, they seem like they’re in touch with their psychic potential and they claim they can teach others to achieve a deeper awareness using the five senses. I will try to keep my inner skeptic at bay on January 5th when attending the Krystal Krunch tour and workshop, because who knows, with an open mind I might learn a whole new way of seeing art, others, and the world around me. Tell me more about the Never Been to Me Tour? The program is in 2 parts. First you’ll have fun in a workshop that will jump start your intuition and then we will all march down to Midnight Party and ‘see’ the exhibition with our third eyes. In the workshop you will learn how to give and receive an intuitive reading. You will see and be seen in a way that you’ve never experienced before! You’ll hear reflections about who you are beneath the surface and you’ll be able to do that for another person. The takeaway is a connection to human beings that goes beyond the surface, appearance, common interests, and affiliations. You will enter the magic of another human universe. First we will introduce you to some simple and practical exercises to relax and expand your awareness of the five senses. Then we will help you open your awareness of your intuition. You will be guided through a non-denominational meditation designed to uplift your spirts and serve those you love. We’ll show you the chakra system in the body and take you through simple exercises to see through the charka system into the energy of a partner you’ll either come with or someone you’ll pair off with. Everybody is embarrassed at first but it quickly becomes a warm and connected experience. We will then head down to the exhibition and we’ll experience it psychically with our eyes closed- responding to the images in our mind’s eye and the feelings we get from the objects. I’m not psychic, how can I really do this? We’re not psychic either. We’re intuitives. Everyone has intuition. We just need to learn to listen to it. I don’t have a partner and I’m a shy person, will I feel awkward and out of place? We hope not. Krystal Krunch provides a supportive, warm, laugh-filled environment that acknowledges everyone’s trepidation. I’ve seen Ghost Hunters, are we dealing with the paranormal? We watch Ghost Hunters too, but no, we are dealing with the very normal. We are looking into our hearts and eyes and seeing our inner selves. Most of us have never really been ‘seen’ by another person. It is thrilling to be acknowledged for your innate gifts and strengths in all their limitless possibility. And it is doubly rewarding to be able to give that to another. It is just as, if not more, exhilarating as ghost hunting. I’m not psychic. How do I know I can do this? If you’re a human you can do this! Come with an open mind, a loving heart and availability and you will have a valuable experience. Will my dirty secrets be known? If you whisper it to us clearly and slowly. What if I hear something I don’t like? Giving and receiving an intuitive reading is a collaborative process. As the giver, you give what you feel. As the listener, you stay open and available to the reader. Listen with an open heart, take the information home with you, and let it unfold over time. You’ll be surprised what you discover. No. The workshop and tour is for people 17 years and older. 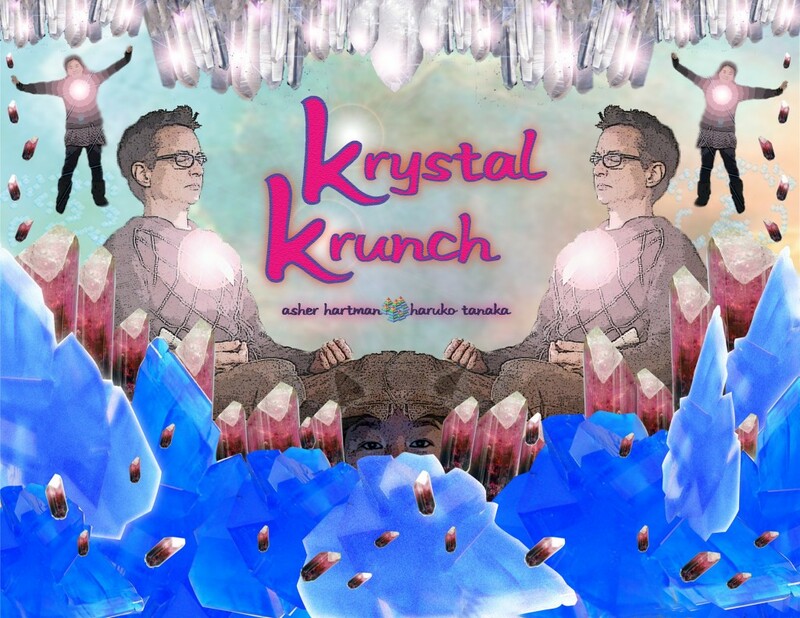 Are Krystal Krunch licensed hypno-therapists/mental health counselors? No. We are 2 artists who use our intuition to bring people closer together. Krystal Krunch (aka Asher Hartman and Haruko Tanaka) is a duo of artist intuitives who see and respond to energy in the body, the psyche, and architectural spaces. They are dedicated to using intuitive reading to help people come in contact with their highest and best potential, discovering who they really are so that they might approach their lives and others with compassion, self-love, and wonder. Krystal Krunch debuted in 2007 with TnT Explosive Advice: the 10 minute takeover at High Energy Constructs in L.A.’s Chinatown where they gave 10 minute intuitive readings to gallery visitors. 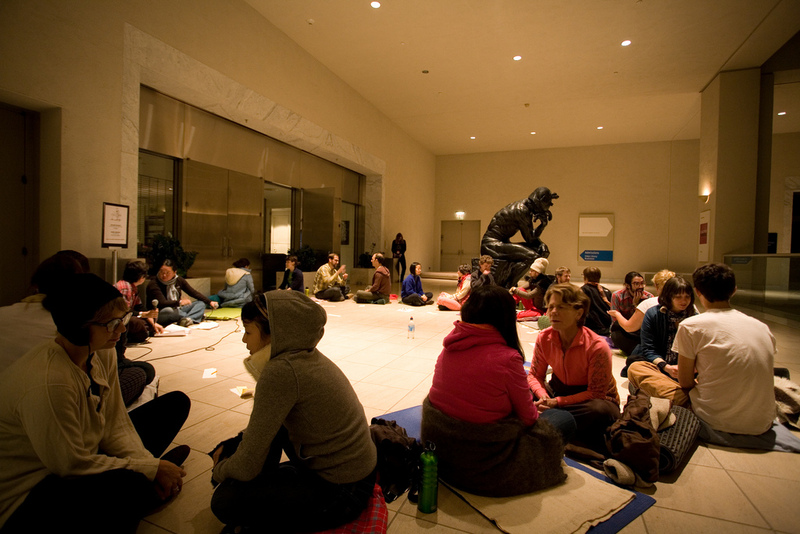 They have since developed and presented numerous intuition building workshops including Dreaming the Invisible Body Politic at The Hammer Museum, Zero Max: Turning your trash into gold at the Eagle Rock Arts Center, Lovereflections Machine Project and Seeing Beyond Speech with students at Pomona College, Loyola Marymount University, California Institute of the Arts, and SPACES in Cleveland, Ohio. Haruko Tanaka is an interdisciplinary artist whose artistic practice ranges from photography, film/video, and installation, to relational collaborative events and workshops. Her passion lies in the translation and transmission of intangible cultural treasures. Her work has been screened and exhibited in such places as the International Film Festival Rotterdam, Asian American International Film Festival at Asia Society, the Museum of Modern Art, the Japanese American National Museum, the CUE Art Foundation, and Sea & Space Explorations. Her collaborative relational events and workshops have taken place at South Central Farms in South Los Angeles, Crazyspace, the Hammer Museum, Machine Project, and SPACES in Cleveland, Ohio.